The Bald Terrier Harley Sportster 1200 by Deus Ex Machina was originally born out of previous design from Deus, the V Twin Café Racer, which received rave reviews immediately after it was rolled out onto the showroom floor. 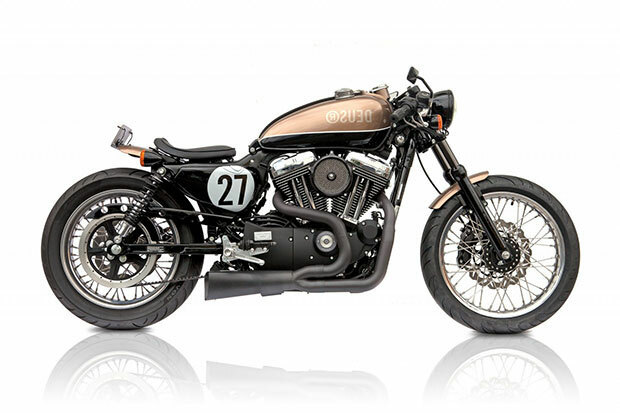 Almost as quickly, a new concept was formulated by Deus top dogs based on the great success of the Café Racer. The design team was provided with some very simple and brief directives. Deus wanted a similar style to the bike but with a little extra handling performance and with a lot more extra braking power. The new model would end up being called “The Bald Terrier” and was developed from an existing fuel injected 2007 Harley Davidson Sportster 1200. The donor bike was stripped to the frame with a long, detailed list of customized parts and enhancements to be added one-by-one, including custom 18” and 19” wheels with specially designed rotors and calipers. A performance exhaust by Vance and Hines was installed along with rear sets by Storz. Final modifications included an electric speedometer by Daytona, customized rear shocks by Ikon, and one off inch clip-on bars by Tingate. The front end of the Bald Terrier is perhaps the most impressive, with fork sliders made of black chrome.